Astronomers have used NASA's Chandra X-ray Observatory to make the most detailed probe yet of the distribution of dark matter in a massive cluster of galaxies. Their results indicate that about 80 percent of the matter in the universe consists of cold dark matter -- mysterious subatomic particles left over from the dense early universe. The galaxy cluster Abell 2029 is composed of thousands of galaxies enveloped in a gigantic cloud of hot gas, and an amount of dark matter equivalent to more than a hundred trillion Suns. At the center of this cluster is an enormous, elliptically shaped galaxy that is thought to have been formed from the mergers of many smaller galaxies. Credit: NASA/CXC/UCI/A.Lewis et al. Chandra observed a cluster of galaxies called Abell 2029 located about a billion light years from Earth. The cluster is composed of thousands of galaxies enveloped in a gigantic cloud of hot gas, and an amount of dark matter equivalent to more than a hundred trillion Suns. At the center of this cluster is an enormous, elliptically shaped galaxy that is thought to have been formed from the mergers of many smaller galaxies. 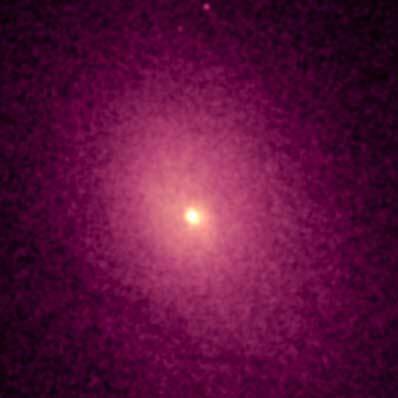 The X-ray data show that the density of dark matter increases smoothly all the way into the central galaxy of the cluster. This discovery agrees with the predictions of cold dark matter models, and is contrary to other dark matter models that predict a leveling off of the amount of dark matter in the center of the cluster. "I was really surprised at how well we could measure the dark matter so deep into the core of a rich cluster," said Aaron Lewis of the University of California, Irvine, lead author of a paper describing the results in a recent issue of The Astrophysical Journal. "We still have very little idea as to the exact nature of these particles, but our results show that they must behave like cold dark matter." Cold dark matter gets its name from the assumption that the dark matter particles were moving slowly when galaxies and galaxy clusters began to form. Dark matter particles interact with each other and "normal" matter only through gravity. The astronomers' success in placing such tight constraints on the dark matter distribution was partly due to Chandra's ability to make a high resolution intensity and temperature map, and partly due to their choice of a target. The cluster and central galaxy are unusually regular, with little or no sign of disturbance. The hot gas in a cluster is held in the cluster primarily by the gravity of the dark matter, so the distribution of the hot gas is determined by that of the dark matter. By precisely measuring the distribution of X-rays from the hot gas, the astronomers were able to make the best measurement yet of the distribution of dark matter in the inner region of a galaxy cluster. "While Abell 2029 might be boring for the average person to look at," said David Buote, a coauthor of the paper, "it is a pure delight for astrophysicists to study, because it allows for a very straightforward and accurate comparison of theory and observation." As a case in point, earlier observations of the Hydra A galaxy cluster by Larry David of the Harvard-Smithsonian Center for Astrophysics in Cambridge, Mass. 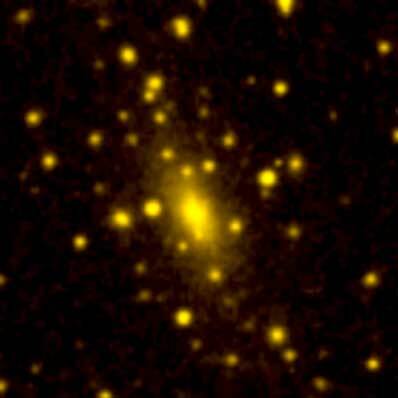 and colleagues found a similar result but the evidence of explosive activity in the central galaxy made it difficult to draw definite conclusions about the nature of the dark matter. The dark matter profile deduced for Abell 2029 provides evidence that the Hydra results are reliable and is an important independent confirmation of cold dark matter predictions. John Stocke of the University of Colorado, Boulder was also involved in this research. Chandra observed Abell 2029 with the ACIS detector for 5.6 hours on April 12, 2000. NASA's Marshall Space Flight Center, Huntsville, Ala., manages the Chandra program for the Office of Space Science, NASA Headquarters, Washington. Northrop Grumman of Redondo Beach, Calif., formerly TRW, Inc., was the prime development contractor for the observatory. The Smithsonian Astrophysical Observatory controls science and flight operations from the Chandra X-ray Center in Cambridge, Mass.